The SNES era of gaming was fantastic, as it was a time that saw many of the best RPGs ever. Games like Chrono Trigger, Secret of Mana, Final Fantasy III/VI and others are of that superior caliber that continue to influence modern developers and, with their stories and gameplay, still effortlessly outperform modern RPGs that have come about since. However, among these masterpiece-level games, you also have hidden gems that are lesser known, but are still very much worth exploring. The Soul Blazer trilogy, also known as the Gaia series, falls into this category, as they don’t have the same mainstream popularity as some of Squaresoft’s best efforts. However, within the RPG hierarchy, they definitely hold a place close to the top. The developer/producer team of Quintet and Enix carved their place in RPG eminence by defining their works with tonally darker stories that are full of emotion and rife with hardships. They were not afraid to explore more abstract philosophical and metaphysical themes, which exalt their narratives to a level rarely achieved. 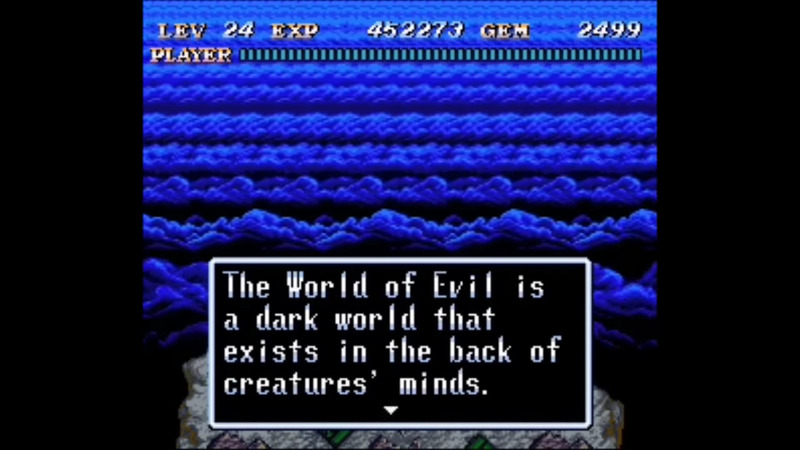 Soul Blazer is the first of the Gaia series and introduces many of the recurring themes throughout its three games. Philosophical and religious elements, such as the presence of a benevolent deity versus a form of malevolence, is a constant. The concepts of regeneration, reincarnation, and resurrection, although utilized in varying ways, are also present throughout the series. It may not always be obvious due to the stricter censorship Nintendo implemented in regards to religious content, but the influences from Christianity, Buddhism, Greek mythology, etc., are present. 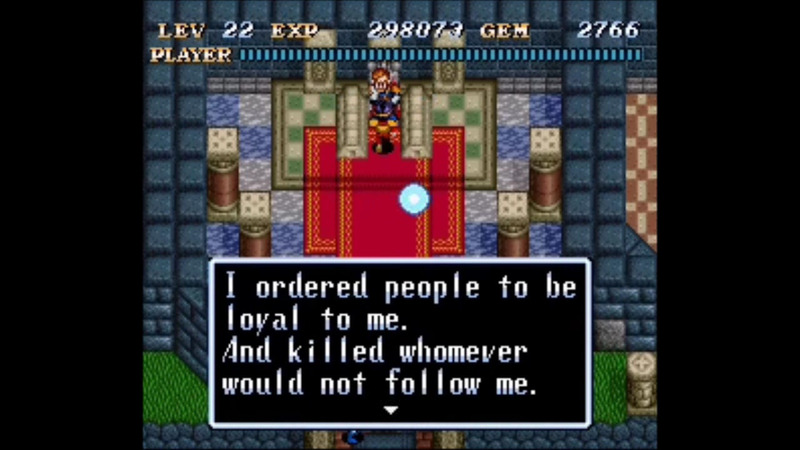 In Soul Blazer, The Master, representing God, sends one of his subordinates (known as Blazer) to free the people of the Freil Empire from Deathtoll (the devil). All living things (Creation) have been imprisoned after the emperor, King Magridd, tried to make a pact with Deathtoll. A brilliant scientist named Dr. Leo is forced by Magridd to build a machine that would allow him to contact Deathtoll, which results in Deathtoll betraying Magridd and taking control of the souls of every living creature. Dr. Leo, through his past relationships, influences and accomplishments, indirectly aids Blazer as he frees the souls of the living and restores the world. 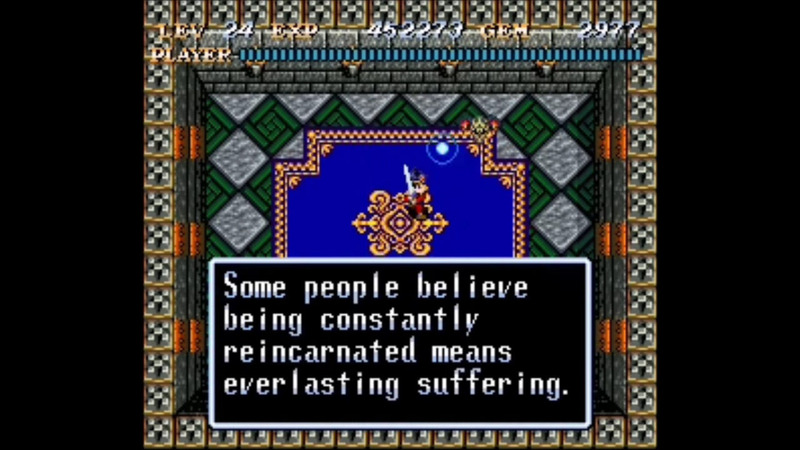 In terms of story, Soul Blazer definitely feels like a first effort. There is enough of a story to formulate a plot, missions to accomplish, and a final, overall goal, but the setup and subsequent storytelling lack detail and polish. To start, we’re told that the reason why Magridd sold his people to Deathtoll was because of consuming greed. So, Deathtoll agreed to pay Magridd for the souls of his people. We can then ascertain that Deathtoll betrayed Magridd, stole his soul, and went on to imprison all life because, you know, he’s evil. That gets us to the point where gameplay starts, but that intro really doesn’t do much to build up the dire nature of the whole situation, so it’s lacking any genuine immersion at first. Fortunately, as the game progresses, some of the intensity of the situation does work its way through. As you start defeating enemies and restoring the world, the dialogue with the NPCs does a nice job of filling in the story and bringing some much needed life and emotion. Many of the characters seem to be fully aware of their recent entrapment and Deathtoll’s power, as well as the lingering threat he poses as long as he’s able to influence the world. These NPCs show genuine concern for their loved ones and communities while also providing those notes of desperation and fear one would expect from world-ending events. It’s greatly appreciated in a story that needs more of it. We also learn that several named NPCs have had prior connections with Dr. Leo, allowing for some noteworthy story building. Early on, we find out Dr. Leo has a daughter, Lisa, who’s been through her own set of ordeals, as her father is forcefully taken from her and she flees from her home. Dr. Leo also had a number of pets and possessions, such as Turbo the dog and Marie the doll, that lend their knowledge and support, while also filling in the story both before and after the prologue. These specific interactions serve to build the story and add much needed immersion, but also act as a means to guide Blazer through his adventure. The plot elements influenced by religion and other real life factors also help color in the story. From his actions, we can assume that Deathtoll represents Satan, and Freil Kingdom represents an incarcerated Creation. The Master represents God and Blazer represents divine intervention as humanity is trapped. From there, we can deduce good versus evil and make comparisons between the game and real life. That, in itself, helps support the story, because much of who The Master, the Soul Blazer, and Deathtoll are goes unsaid. It is up to the player to draw parallels and make the deductions as to who these characters are. The impact gained from drawing these comparisons provides much needed substance to the story. However, implication, assumption, and theory building can only take a story so far. Rather than all of this supposing, I would have preferred a more concrete, fleshed out development of these major characters, especially since their actions affect the entire game world, yet we learn so little about them. Despite the gains from dialogue, interaction, and borrowed religious content and mythology, the overall story still has its shortcomings. As I mentioned, hardly any detail is given about the major characters of the game. None of the NPCs get any real character development with the exception of Dr. Leo. Leo is nicely developed as a victim, forced into helping evil for the sake of saving his daughter. We learn of his intelligence, but also his creativity and compassion towards life while loathing Magridd and Deathtoll. More of this kind of character development would have been fantastic because Leo’s was constant and comprehensive throughout. We were always learning about Dr. Leo up to and past the point of finally meeting him. In contrast, Lisa is only seen two to three times in the game, yet it’s just haphazardly thrown at us that she’s fallen in love with Blazer despite minimal plot driven meetings, one of which isn’t the most nurturing for romance. I have no problems with the romance itself, but something as significant as this needs far more attention than it received. 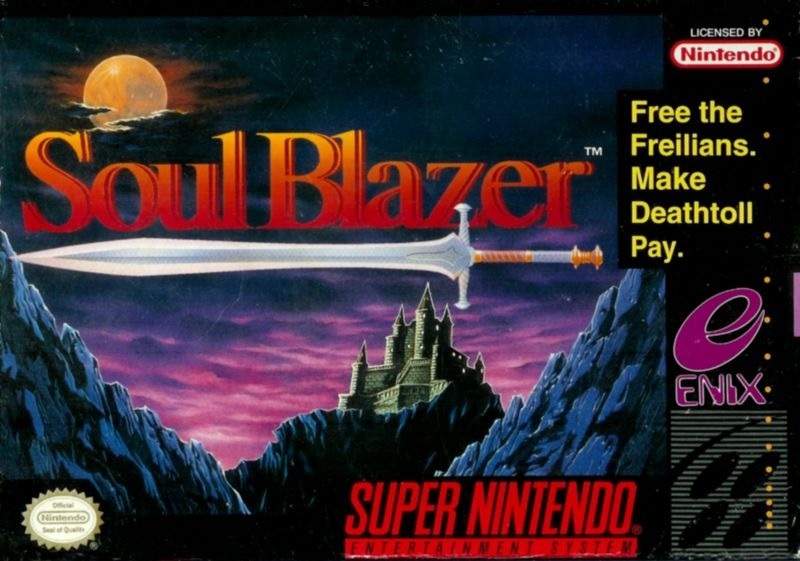 Finally, I don’t know whether the devs knew Soul Blazer was the start of a series and not just one standalone game. It’s only later in the series that we learn that The Master and Deathtoll, along with any allusion to God and the devil, are in actuality Light Gaia and Dark Gaia. To say the least, it was a gargantuan oversight not to develop them, and a missed opportunity to set up the next two games. Despite the inconsistencies in story quality, Soul Blazer has solid gameplay. With its overhead style and combat reminiscent of A Link to the Past, gameplay is fun, challenging, and satisfying. Interaction with the world around you is simple and entertaining, as Blazer restores everything from cities and kingdoms to all of their inhabitants. Restoring landscapes and their people reveal new areas for obtaining hidden items and gear to power up Blazer, and provide information, quest hints, clues to hidden items, and in some cases, extra enemy caches for more experience and bonuses. Freeing the world is done exclusively through combat. 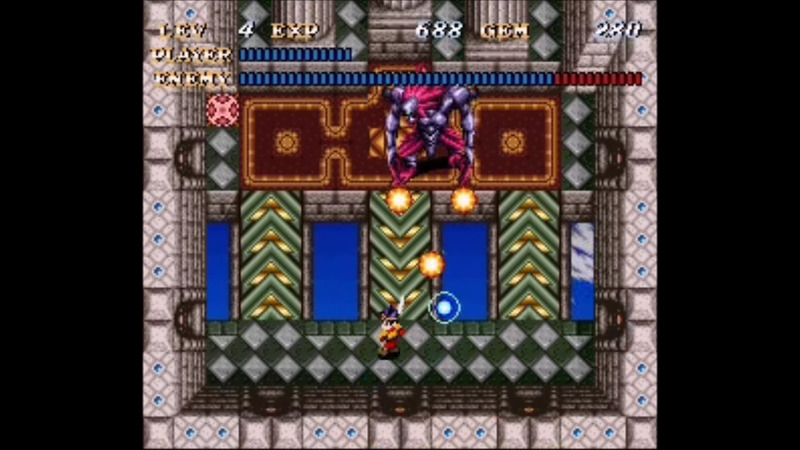 Each dungeon has a number of enemy lairs, represented by round flashing circles from which enemies spawn. Defeating all the enemies and stepping on the disc opens the lair, which releases the imprisoned section of land and the NPCs within. 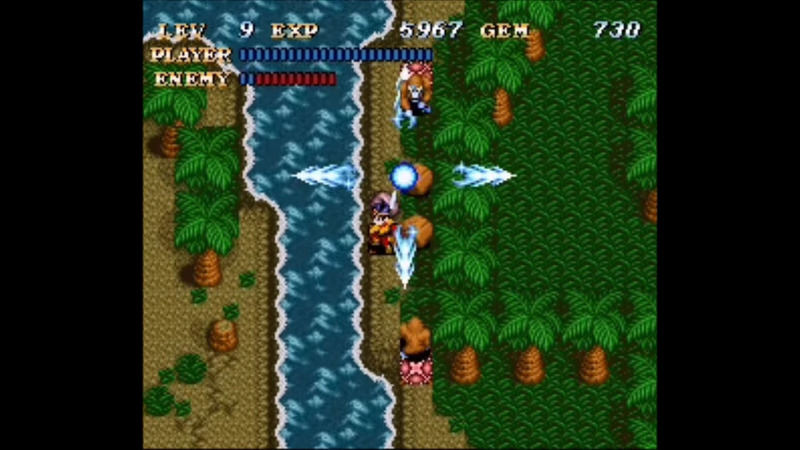 Combat consists of slashing, a stance of holding the sword in front, and using magic. The stance is paired with crab-walking, allowing Blazer to sidestep while doing damage should enemies make contact with his blade. Blazer can also use magic by consuming gems to launch a spell. Spells are equipped one at a time, similar to equipping a single weapon or armor suit. Launching magic attacks is unique in that the magic stems from the soul that constantly encircles Blazer, so directional input plus timing is necessary for a spell to hit. What’s most important in combat is positioning. Good positioning in regards to the location of a lair and the spawn rate of enemies can make all the difference. If you take into account spawn location and rate, you maximize your ability to dispatch enemies without taking much damage, if any. This is extremely crucial because HP is only recovered by visiting particular NPCs in town or by speaking with The Master. Also, leveling up is structured in such a way that it is difficult to become overpowered, which forces you on a pace that keeps enemies challenging to defeat as the game progresses. Fortunately, enemy types and spawn patterns are somewhat repetitive, so observing one prepares you for others. Positioning yourself at a certain angle, offset, and at a distance can mean the difference between life and death. It’s an effective method to create challenge, but it’s also incredibly satisfying when you learn how to defeat foes quickly and efficiently. In regards to aesthetics, Soul Blazer absolutely looks and sounds like a game from 1992. Visually, the game is colorful and detailed, plus the devs beautifully depict the differences between a bare, imprisoned world and one free and full of life. Every time a lair is unlocked, it’s always exciting to see the restoration. Sometimes it’s just an NPC, but other times, entire halls and castles are restored. The play on that stark contrast between empty and lively is exceptional and always a thrill to look forward to during play. Unfortunately, the audio is not as spectacular. The soundtracks are a bit too short, meaning that they get irritating pretty quickly when looping. This is particularly noticeable in towns as there are only two tracks used, one that plays prior to restoration and the other after restoration. By themselves, they’re fine, but because of how often you hear them and because of how short they are, the constant loop becomes very nerve-racking. This isn’t as noticeable in dungeons, as there is variety in those tracks and gameplay is a welcome distraction. Again, visually pleasing, audibly needing. Overall, Soul Blazer is a fun and challenging adventure, remarkable for its combat and unique gameplay. The theme of restoration is well executed and the quest is one worth battling through. 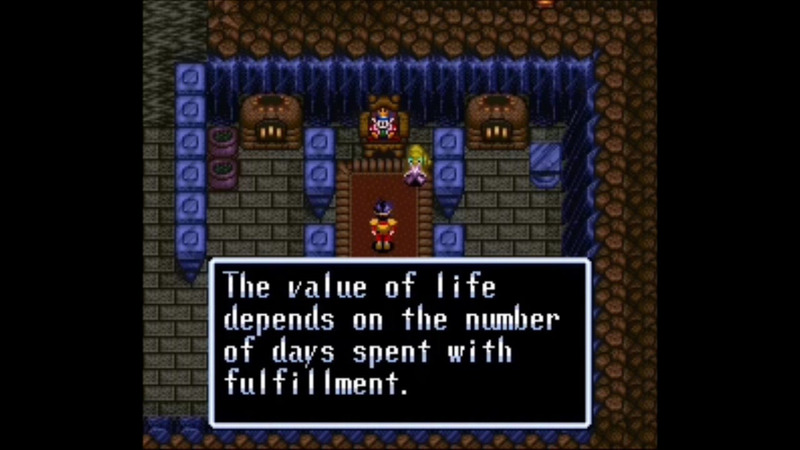 Despite the setbacks in regards to its story, Soul Blazer is unquestionably deserving of a playthrough by anyone who is a fan of SNES era RPGs. It is especially memorable as it introduces elements that serve to make the later games in the Gaia series even greater than their predecessor.